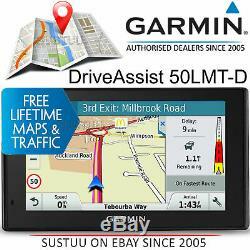 Garmin DriveAssist 50LMT-D 5 GPS Sat Nav+Dash CamLifetime Europe Maps+Traffic. Advanced Navigation with Built-in Dash Cam. Innovative 5.0-inch sat nav with built-in dash cam that continuously records your drive and saves video on impact. Detailed maps of Europe with free lifetime¹ map updates and free lifetime digital traffic², the fastest traffic solution available from Garmin. Free Garmin DIGITAL Traffic via DAB. Garmin's best traffic solution - out of the box! Integrated camera allows for Forward Collision Warning3, Lane Departure Warning³. Smart features keep you connected while driving, including Bluetooth® hands-free calling4, voice-activated navigation and smartphone notifications5. Driver alerts for increased awareness, including upcoming sharp curves, school zones, speed changes and more. Offering the protection of an eyewitness that never blinks, Garmin DriveAssist comes with a compact, built-in dash cam that continuously records your drive. If a collision occurs, Incident Detection G-sensor will automatically save files on impact. GPS records exactly where and when events occurred. Easily play back video footage right on the device, along with a map view of where you were, at the time of the incident. If you like, you can watch footage later on your computer using our. The snapshot feature on the device also allows you to capture still images, so you can even remove the unit from your vehicle to take close-up pictures of any collision damage. For storage of your recorded video data, a replaceable microSD card (class 10) is included. Garmin DriveAssist uses camera-assisted driver awareness features and driver alerts to encourage safer driving and increase situational awareness. When your car is stopped at a junction or in traffic, Go Alert notifies you when traffic in front of you has started to move. Forward Collision Warning alerts if youre driving too closely to the vehicle ahead. And if you drift off the road or into oncoming traffic, youll see and hear Lane Departure Warning alerts. Hard-to-read house numbers are a thing of the past, thanks to the Garmin Real Vision feature. When approaching select destinations, your navigation display will switch to camera view, and a bright arrow will point to where you need to go. Helpful Driver Alerts for Your Daily Commute. Garmin DriveAssist notifies you when driving the wrong way on a one-way street and sends warnings for nearby school zones. Receive alerts for nearby red light and speed cameras6, and be prepared for sudden halts in traffic with upcoming traffic jam7 warning. For longer drives, a fatigue warning8 suggests break times and potential rest areas after hours of driving. Other safety features include alerts for sharp curves, speed changes, railway crossings, animal crossings and more. The Up Ahead feature lets you easily see places up ahead and milestones along your route like borders, without leaving the map view. 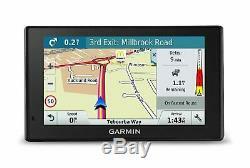 Garmin DriveAssist offers you the option of convenient voice-activated navigation. Control Garmin DriveAssist with your voice, while your hands remain safely on the wheel. Sync a Bluetooth-enabled device, such as your smartphone, to Garmin DriveAssist for hands-free calling, and receive smart notifications on your Garmin DriveAssist display. Stay focused on your drive ahead while staying connected with customisable smart notifications that conveniently appear right on your navigation display. For real-time information such as weather and traffic conditions, download. 9 mobile app, which connects your Garmin DriveAssist GPS sat nav with your compatible smartphone. Garmin Digital Traffic via DAB. 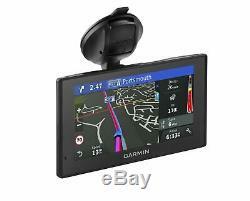 Is Garmin's best plug & play traffic solution. Digital Traffic is fast and free2 for the useful life of your device. Receive traffic updates as often as every 60 seconds. Plus, Digital Traffic has a great coverage area that includes motorways, A roads and more minor roads - everywhere you need it. Digital Traffic is voice-activated, so it responds to spoken requests. It can give details about the situation, such as how many minutes of delay to expect and if there are any possible detours. Even learn whether or not you are on the fastest route. Traffic information is delivered straight to your device, out-of-the box. Garmin DriveAssist display redefines spoken turn-by-turn directions with Garmin Real Directions, easy-to-understand driving directions that guide like a friend, using recognisable landmarks, buildings and traffic lights e. Turn right after the red building or Turn left after the McDonalds. Its preloaded with millions more new and popular places, thanks to Foursquare®. Find Exactly Where You Need to Go. The Direct Access feature simplifies navigating to select complex destinations, like airports and shopping centres, by finding a place within a larger location. When navigating to the shopping centre, Direct Access gives additional location information for specific retail stores inside. For example, Arriving at Lakeside. Debenhams is inside, on the upper level. Easier to Search, Quicker to Find. 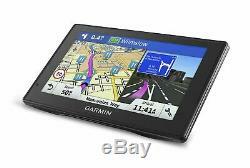 Garmin DriveAssist display has a search field that makes it easy to find addresses and millions of POIs. In case of a misspelling, Garmin DriveAssist provides multiple search results that sound similar to what youve entered. Add an Additional Camera to Your Drive. 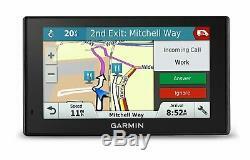 For a complete navigation solution, Garmin DriveAssist display pairs with the. BC 30 wireless backup camera. Once connected, you can easily see vehicles, pedestrians and other obstacles right on the Garmin DriveAssist display, as you move in reverse. When traveling with a baby or toddler, add Garmin. BabyCam is an in-vehicle video baby monitor that conveniently provides an on demand view of your backseat passenger, right on your navigation display. Features full coverage for Romania, Guadeloupe, Martinique, St.
Barthélemy and French Guiana, and increased detailed coverage for Bosnia and Herzegovina. Also includes Western Europe and many countries in Eastern Europe, specifically. Great Britain and Republic of Ireland. Isle of Man: Full coverage. Denmark, Finland, Iceland, Norway, and Sweden. Italy, Austria, Switzerland, and Liechtenstein. Cyprus: Full coverage of Republic of Cyprus; Major urban areas with intertown roads in disputed areas. Bosnia & Herzegovina: Full coverage. Serbia & Kosovo: Full Coverage. Montenegro: Coverage for most urban areas. Republic of Macedonia (FYROM): Full coverage. Ukraine: Coverage for most urban areas. THE LATEST IN TECHNOLOGY DELIVERED WORLDWIDE. Newly Overhauled by Garmin and Guaranteed as New Condition. ITEM DISPATCHED FROM OUR UK WAREHOUSE. 14.0x 8.4 x 2.1 cm (2.6 cm, including camera). 11.1x 6.3 cm; 5.0 diag (12.7 cm). WQVGAcolor TFT with white backlight. Voice-activatednavigation (operate device with spoken commands) Full Europe version only. Laneassist with junction view (displays junction signs). Speedlimit indicator displays speed limit for most major roads in the U. Driveralerts for sharp curves, school zones, red light and speed camerawarnings and more: Yes. Camera-assistedfeatures for Forward Collision Warnings, Lane Departure Warnings, "Go"Alert and Garmin Real VisionT: Yes. GarminReal DirectionsT landmark guidance: Yes. Lifetime Traffic Antenna/Vehicle Power Cable. Comes in GARMIN Retail Packaging so makes a Great Gift. This product has no reviews yet, however see what our buyers say about our other products.. We can deliver to anywhere in the World! Or give us a ring anytime from 09:00 to 17:30 GMT, Monday - Friday, on 0203 0111 888. 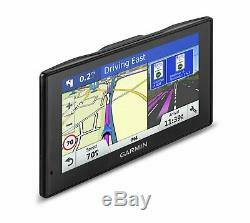 The item "Garmin DriveAssist 50LMT-D 5 GPS Sat Nav+Dash CamLifetime Europe Maps+Traffic" is in sale since Sunday, August 19, 2018. This item is in the category "eBay Motors\Parts & Accessories\In-Car Technology, GPS & Security\GPS & Sat Nav Devices\Portable GPS Systems".